A root canal is one of many dental procedures performed by Lexington, SC dentists Drs. Smith & Robinson. The purpose of a root canal is to clean and shape the canals located inside the tooth’s root. Sometimes, when tooth decay is advanced enough or a tooth has been cracked, bacteria can reach the core chamber of the tooth, which contains the pulp — soft tissue made up of nerves and blood vessels. 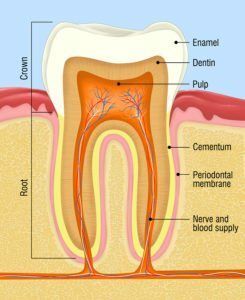 The pulp extends all the way down through canals in the tooth’s root to the very bottom. If the pulp comes into contact with bacteria, an infection can form and spread down into the tip of the root. In these cases, a “root canal” is performed by a professional to clean out the infected pulp and restore the tooth. Because the inner pulp of the tooth is filled with nerve tissue, if it becomes infected with bacteria there can be extensive pain and extreme sensitivity to hot, cold and the slightest pressure from chewing. If left untreated, the tooth eventually dies, and the infection can form an abscess at the bottom of the root canal. An abscessed area can grow large enough to extend into the bone and tissue around it, resulting in widespread bacterial infection. This is why people who undergo root canal procedures in Lexington, SC are often treated with antibiotics. The only other option for an infected tooth is removal of the tooth completely, which is not an attractive option cosmetically and functionally. The loss of a tooth leads to impaired chewing and biting, which could in turn cause other teeth to shift. A root canal procedure typically is done in two visits to your Lexington, South Carolina dentist. The first step in diagnosing the extent of tooth damage is to take dental X-rays of the area. Patients are then given local anesthetic to control the pain. A rubber dam will be placed over the tooth to isolate it from saliva and debris. Any decay is cleaned away, and then an opening is made with small dental instruments into the tooth’s crown in order to access the pulp chamber. The diseased pulp is then cleaned out of the chamber as well as the canals that extend down into the root. The whole area is disinfected, dried and, in some cases, medicated to ensure that the infection has been completely destroyed. A rubber compound and sealer paste are used to fill the clean, empty root canals, followed by a dental filling for protection. Now the tooth is ready for restoration. A new crown is typically the restoration needed to get you ready for biting, chewing and smiling again. Most root canal procedures are covered by dental care insurance, though the exact cost will vary depending on the tooth and the dental office. Molars have more root canals than other teeth like incisors, which only have one root canal. A root canal procedure for a multi-rooted tooth can range from $700 to $1,400 depending on the complexity. The procedure for a single-rooted tooth can range from $400 to $800. Your Lexington, SC dentist can give you a much more accurate idea of the cost when your initial examination is performed. No! A local anesthesia is used to control the pain during the procedure, and most of the time, root canal patients can return to work or their normal activity immediately following the procedure. Taking extra care when eating and chewing on the opposite side of the mouth is generally a good idea until the tooth is properly restored with a crown. As the local anesthesia wears off, there may be minor discomfort from the dental dam and some swelling of the gums around the tooth. This can be easily controlled with ibuprofen or other over-the-counter medications. If you’re experiencing extreme tooth sensitivity and suspect you need a root canal, you might want to speak with a specialist. Smith and Robinson, DMD is located in Lexington, SC and serves residents throughout Columbia, SC and surrounding areas.